Long before the advent of the door there was the bench. Now you’re probably thinking, what has a bench got to do with a door, well nothing and everything. Long ago in homes big and small, one could freely move from one room to another without obstacle. That was a time of no doors, no privacy and lots of interruptions. As human beings, we are social creatures, we play together, work together and of course, we live together. On that note, after the advent of the home came the advent of the house guest. Now one could hardly have a guest over without something to sit on, thus the creation of the bench. Why with all these rooms and people living together one could barely have a private conversation. This was a serious problem and like all problems, man would devise a solution. To limit interruptions early man simply placed a bench in the entranceway and had his guest sit on it, thus blocking anyone from entering the room and interrupting a conversation no matter how trivial the subject. Benches you could say were the first doors. What has this got to do with anything you ask? 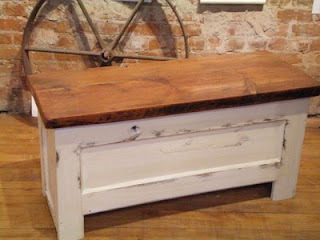 Forever Interiors makes benches from reclaimed doors. What can we build for you?